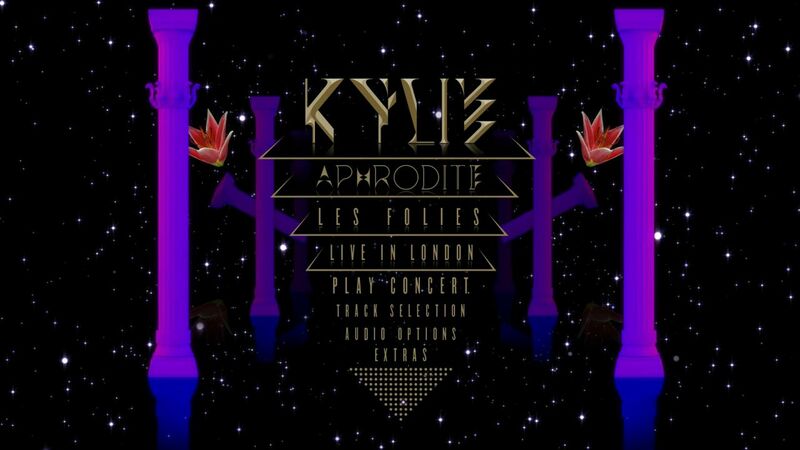 Kylie Minogue Aphrodite Les Folies Live in London was shot in 3D by Blink TV. Originally aired on Sky TV it was decided to release the concert on 3D Blu-ray, Blu-ray and DVD. The 3D and 2D edits of the concert differed due to the nature of the delivery medium. Our first foray in to 3D stereoscopic graphics was an interesting journey and a steep learning curve, but one that was rewarding when we saw the outcome. The concert was divided into 7 acts, each one with it’s own theme and it was decided that these would be used as the basis for the menu graphics. All menus were designed in anaglyphic 3D at first to enable the design team to quickly proof the required effect and check that the parallax being used was correct. Once we were all happy with it we rendered the left and right eye Quicktime movies that were then taken into our AVC video encoder. The feature was then QC’d a number of times in both 3D and 2D to make sure it would be okay on those players which do not playback 3D content. At the same time a separate 2D Blu-ray was produced, which was a slightly different cut with more close ups on Kylie, the dancers and members of the band. The menus for both this and the DVD release used the same look and feel as the 3D version.